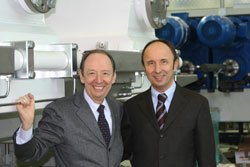 The partnership between Fava and Storci has been consolidated over time: what do its roots lie? The partnership was made possible by the strong relationship of professional esteem that was created with Eng. Enrico Fava in our early years. At that time, we were both working on a project for a large Barilla factory. Our mutual respect and understanding developed over the years to come. In the meantime, I had founded what is now Storci (with my sons Michele and Simone), while Enrico (also with his family) had decided to concentrate on the complete pasta production line market. It was natural for them to think of me for the production of the head of the line: the press. And this was the beginning of our partnership: a fundamental agreement, functional for our mutual development. The results - over 500 lines installed around the world - only confirm the success of and appreciation for our work. From what you say, very strong ties emerge between you and Enrico Fava. Is there also a common thread in the management of the two companies? Certainly. My relationship with Enrico Fava has taught me a great truth, which I still firmly believe in today: in any company, people must always be the centre of attention. Training and motivation must be assured constantly throughout every professional career, stimulating staff to give their best and be ready to face the new challenges offered by the market. Quali progetti ha il gruppo per il futuro? What plans does the group have for the future? We want to continue to produce the best pasta production plants: technologically advanced, innovative lines offering top quality. We have a number of projects in the pipeline: last but not least is one for gluten-free pasta. A product targeting a market segment that has seen important growth in the past few years. And which doesn't seem to be slowing down.